Watch an interview with Alexander Garvin on PBS's "MetroFocus"
Can planners—or anyone—improve a neighborhood, city, suburb, or region? Planning does work: this book explains how. 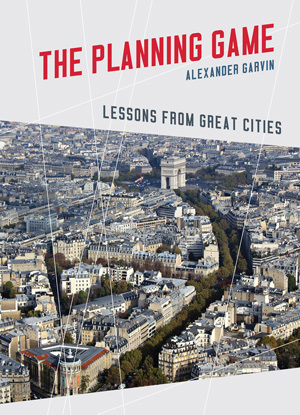 The Planning Game: Lessons from Great Cities provides a focused, thorough, and sophisticated overview of how planning works, generously illustrated with 200 colorful photographs, diagrams, and maps created expressly for the book. It presents the public realm approach to planning—an approach that emphasizes the importance of public investments in what we own: streets, squares, parks, infrastructure, and public buildings. They are the fundamental elements in any community and are the way to determine our future. 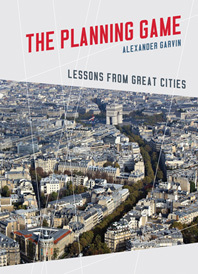 The book covers planning at every level, explaining the activities that go into successfully transforming a community as exemplified by four cities and their colorful motive forces: Paris (Baron Georges-Eugene Haussmann), New York (Robert Moses), Chicago (Daniel Burnham), and Philadelphia (Edmund Bacon). The Planning Game is an invaluable resource for planners, students, community leaders, and everybody involved with making better places to live.